At Cochran INFINITI Gallery of North Hills, we offer new INFINITI cars in Wexford, along with used cars, trucks and SUVs by top manufacturers. Our sales staff will help you find that new or used car you have been searching for in Wexford. We will help locate the luxury car or sports car in Pittsburgh’s North Hills you are looking for. For years, our auto finance staff at Cochran INFINITI Gallery of North Hills has offered expert advice for those seeking a great INFINITI car loan or lease in Wexford. Our service doesn’t stop there. Pennsylvania customers can come in and take advantage of our knowledgeable INFINITI car repair technicians and a fully-stocked inventory of INFINITI car parts and accessories in Monroeville. Be sure to check out our auto body repair and collision repair options too. 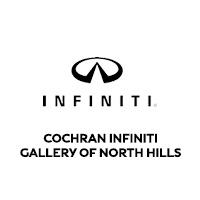 You can reach Cochran INFINITI Gallery of North Hills any time by filling out our contact form, by calling us, or simply visiting our Wexford INFINITI dealership at 11740 Route 19, Wexford, PA. We are convenient to Cranberry Township, Sewickley, McCandless, Gibsonia, Fox Chapel.